This text was first published at Steve Summerfelt’s LinkedIn profile 14 April 2016. CtrlAQUA is a center for researched-based innovation working to develop technological and biological solutions for producing larger Atlantic salmon, primarily post-smolt at sizes up to 1000 g (2.2 pound). The center seeks to find ways to make closed-containment aquaculture systems a reliable and economically viable technology for producing larger Atlantic salmon. The Conservation Fund Freshwater Institute is a partner in the CtrlAQUA research center and is participating in the HYDRO and PHOTO projects. The HYDRO project is examining hydrodynamic challenges in huge culture tanks (more than 1,000 cubic meters [a quarter million gallons]) and seeks to optimize conditions for fish culture within these large tanks. This work is important because of the great potential to reduce fixed and variable costs with the application of large circular-type culture tanks for smolt and post-smolt production. 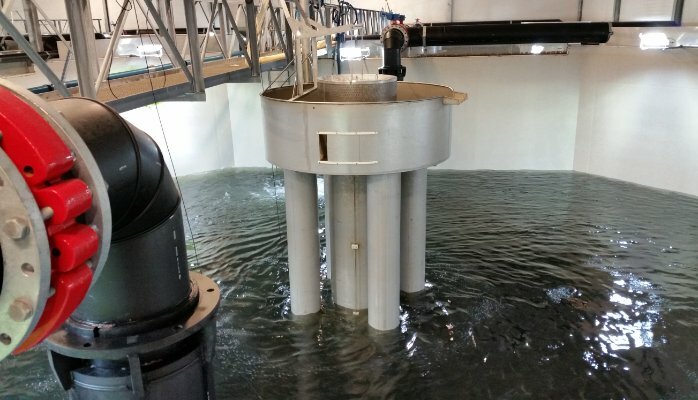 A survey was conducted to determine the geometry, operating parameters, and other key features of large circular or octagonal culture tanks used to produce Atlantic salmon smolt and post-smolt at six major Norwegian Atlantic salmon production companies. All six companies participating in the survey are partners in the CtrlAQUA project. A total of 55 large tanks were reported at seven land-based hatchery locations, i.e., averaging 7.9 (range of 4-12) large tanks per land-based site. In addition, one 21,000 m3 floating fiberglass tank was reported. Culture volume ranged from 500 to 1300 m3 for each land-based tank. Most tanks were circular, but one site used octagonal tanks. Land-based tank diameters ranged from 14.5 to 20 m diameter, whereas the floating tank was 40 m diameter. Maximum tank depths ranged from 3.5 to 4.5 m at land-based facilities, which produced diameter-to-average-depth ratios of 3.6:1 to 5.5:1 m:m. The floating tank was much deeper at 20 m, with a diameter-to-average-depth ratio of only 2.4:1 m:m. All land-based tanks had sloped floors (4.0 to 6.5% slope; approximately 30% for the floating tank) toward the tank center and various pipe configurations that penetrate the culture tank water volume at tank center. These pipes and sloping floors were used to reduce labor when removing dead fish and harvesting fish. Maximum flow ranged from 3 to 19 m3/min per land-based tank, with 400 m3/min at the floating tank, but tank flow was adjustable at most facilities. Land-based tanks were flushed at a mean hydraulic retention time (HRT) of 35 to 170 minutes. Maximum feed load on each land-based tank ranged from 525 to 850 kg/day, but the floating tank reached 3700 kg/day. Almost half of the large tanks reported in this survey were installed or renovated since 2013, including the three tank systems with the highest flow rate per tank (greater than 17.6 m3/min). These more recent tanks were operated at more rapid tank HRT’s, i.e., from 34.8 to 52.5 minute, than the 67 to 170 minute HRT typical of the large tanks built before 2013. In addition, feed load per unit of flow in land-based tanks that began operating before 2010 were higher (48-77 kg/day feed per m3/min flow) than in tanks that began operating later (36-44 kg/day feed per m3/min flow). In comparison, the floating tank operates at a maximum of only 9 kg/day of feed per m3/min of flow, which is the least intensive of all tanks surveyed. Survey results suggest that recent tanks have been designed to operate at a reduced metabolic loading per unit of flow, a tendency that would improve water quality throughout the culture tank, all else equal. This trend is possible due to the ever increasing application of water recirculating systems. A full manuscript describing this work is now being reviewed by a refereed journal.